So I’m standing in line for a flu shot – since children can only get them at clinics and we have an H1N1 outbreak – and there is a record store here. 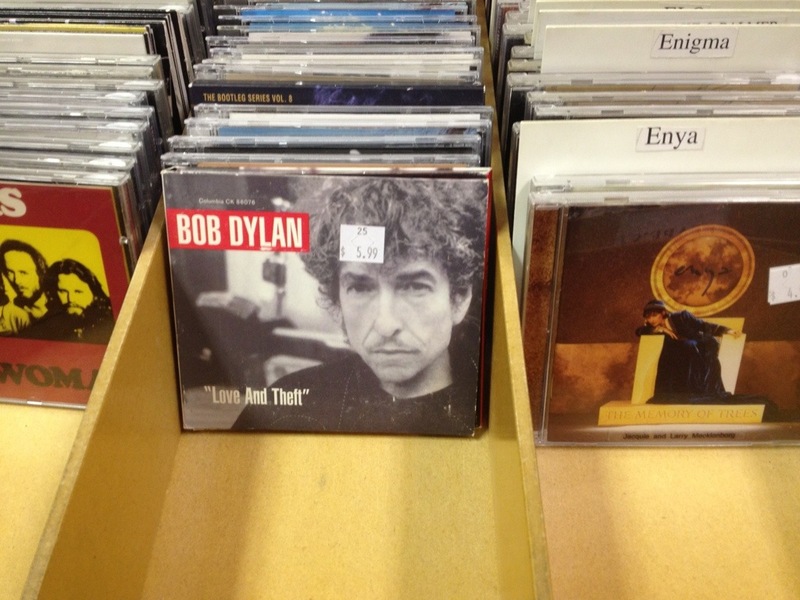 I was drawn to the vinyl Dylan albums on the wall -New Morning, Blood on the Tracks – and wandered in. Flipping through the CDs I found the special edition of Love and Theft (which I don’t own) and, upon opening it, learned that “I Was Young When I Left Home” is, as I always thought, traditional! Now I’m wondering why BobDylan.com credits it to him? My previous comments about how great it is stand, but I’m no longer impressed that he wrote it! This has been the first of approximately two hundred errors I will make this year on this project.